Our walk of Sunday 6 December 2015 takes place at the Adelphi forest area. We start a couple of hundred metres after the historical church of Panagia tis Asinou, which is a National Heritage monument. The walk starts at 10:45 am. Laurent is leading this walk, which will go ahead even in light rain; if you need to, call 96414853. The walk will take 3 hours and is of medium difficulty, involving several uphill and downhill sections. 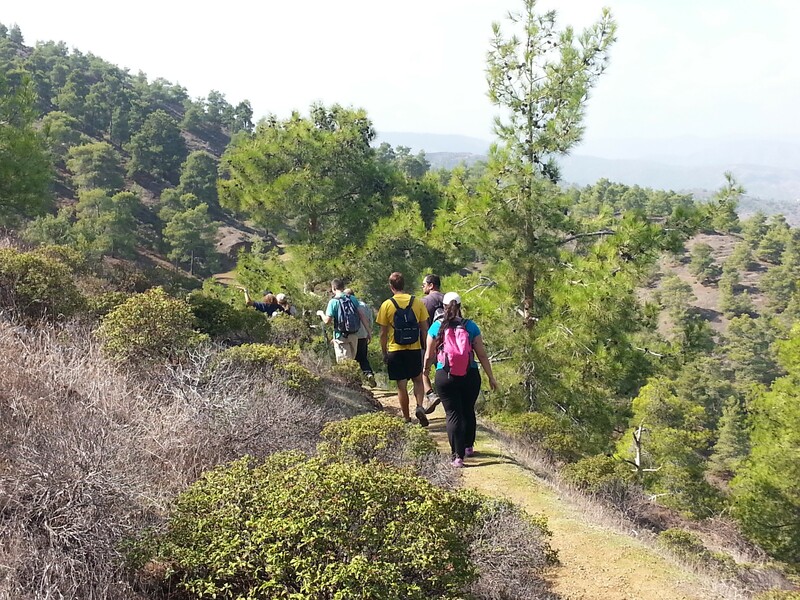 We follow well marked paths, mostly in a pine covered forest, up to the village of Agios Theodoros, in the Solea valley. We take the same paths back. The altitude at start is ~500 m, at the highest point it becomes 650 m, while at the village of Agios Theodoros it is 460 m. The total distance (to and fro) is 11 km. The walk offers spectacular views at several places. At the end of the walk we shall sit down for lunch at the Forviotissa taverna, right opposite the area where we have parked. You need to pre-register for lunch, by sending sms to the walk leader or e-mail to Xenophon by end Friday. From Nicosia take the A9 motorway towards Troodos. The A9 smoothly becomes the B9 highway (towards Troodos), when the motorway ends (near Kokkinotrimithia). On the B9 you drive past the villages of Akaki, then Peristerona and then you reach the village of Astromeritis. At the Astromeritis traffic lights, where most cars turn left towards Troodos, zero your odometer and turn left. At the 3.8 km reading follow the road sign and turn left towards Asinou. Drive past the villages of Vyzakia and Nikitari. At the 14.4 km reading you drive past a picnic area on your right. At the 15.9 km reading you arrive at the Asinou church on your right. Continue to drive straight and after three hundred metres you reach a taverna (named Forviotissa) on your right. There is plenty of parking space opposite the taverna. Park your car. We meet here. The starting point for the walk is a few meters further on from the taverna, where the road bends right and the tarmac leads into a dirt road. About Panagia tis Asinou church: The famous Byzantine church of Asinou, a Unesco World Heritage site, has some of the finest examples of Byzantine wall painting on the island. Asinou comes from the Greek Asine, which is an ancient city founded by immigrants from the Greek city Argolis in the 11th century BC. The church dates to the early 12th century and the murals inside date from the 12th century to the 17th century.